The last edition of The Freewoman appeared on 10th October 1912. Dora Marsden told her readers: "The editorial work has not been easy. We have been hemmed in on every side by lack of funds. We have, moreover, been promoting a constructive creed, which had not only to be erected as we went along, we had also to deal with the controversy which this constructive creed left in its wake.... The entire campaign has been carried on indeed only at the cost of a total expenditure of energy, and we, therefore, do not hold it possible to continue the same amount of work, with diminished resources, if in addition, we have to bear the entire anxiety of securing such resources as are to be at our disposal." Dora Marsden appealed to readers to help fund a new magazine. Teresa Billington-Greig and Charlotte Payne-Townshend Shaw both sent money. Lilian McErie also contributed: "No paper has given me keener pleasure than yours. Its fearlessness and fairness made all lovers and seekers after truth respect it and love it even while differing from many of the opinions expressed therein." In February 1913 Dora Marsden met Harriet Shaw Weaver, who had just inherited a large sum of money from her father. As Les Garner, the author of A Brave and Beautiful Spirit, pointed out: "They were in many ways totally unsuited - on the one hand, the rebellious, radical intellectual and on the other, the quiet, modest, unassuming and orderly Weaver. Yet they took an immediate liking towards each other - Weaver impressed by Dora's intelligence and indeed, her beauty, and Dora by Harriet's keen but systematic approach to the re-launch of the paper. Dora had originally just wanted a chat but they ended up in effect having a business meeting while all the time establishing their mutual respect and admiration". The New Freewoman was launched in June 1913. The journal, published fortnightly, was priced at 6d but readers were asked to pay £1 in advance for 18 months' copies. 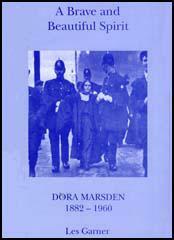 Dora Marsden wrote in the first edition: "The New Freewoman is not for the advancement of Women, but for the empowering of individuals - men and women.... Editorially, it will endeavour to lay bare the individual basis of all that is most significant in modern movements including feminism. It will continue The Freewoman's policy of ignoring in its discussion all existing taboos in the realms of morality and religion." 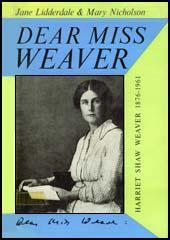 Harriet Shaw Weaver put up £200 to fund the magazine and this gave her a controlling interest in the venture. Dora Marsden was editor, Rebecca West assistant editor and Grace Jardine (sub-editor and editorial secretary). The women were all employed on a salary of £1 a week. Later, Ezra Pound, became the journal's literary editor. H. G. Wells welcomed the new magazine: "I rejoice beyond all measure in the revival of The Freewoman. Its policy even at its worse was a wholesome weekly irritant." Benjamin Tucker said "I consider your paper the most important publication in existence." Winifred Leisenring, the secretary of the Blavatsky Institute, argued that the journal "will educate women and men to think in terms of true freedom, and show them that real individuality exists apart from all our accepted standards." Elizabeth Crawford pointed out that "Marsden... continued her attack on the Pankhursts, using the death of Emily Wilding Davison to highlight her conviction that they were prepared to make use of dedicated individuals, who otherwise were considered as trouble-makers, only when it suited them." Marsden wrote on 15th June, 1913: "Davson's death was merely to give a crowd of degenerate orgiastics a new sensation... Causes are the diversion of the feeble - of those who have lost the power of acting strongly from their own nature." Dora Marsden and Harriet Shaw Weaver became very close. Dora wrote to Harriet claiming that "you have been a perfect treasure to me and the paper". Harriet wrote back expressing her love for Dora. Rebecca West also enjoyed working under Dora, telling her that she was a "wonderful person, you not only write these wonderful first pagers but you inspire other people to write wonderfully." The New Freewoman gradually moved away from its feminist origins. George Lansbury complained about Marsden's abandonment of socialism and others disliked the emphasis she placed on individualism. Her critics included Rebecca West who resigned her post in October 1913 having become disillusioned with the direction the journal was taking. Later she admitted she strongly disapproved of Dora's "aggressive individualism" and her "egotistic philosophy". Dora replaced Rebecca with the young poet, Richard Aldington. At a director's meeting on 25th November 1913, it was decided to change the name of the The New Freewoman to The Egoist: An Individualist Review. Bessie Heyes complained to Harriet Shaw Weaver about the change of name. "Don't you yourself think that the paper is not accomplishing what we intend to do? I had such hopes of The New Freewoman and it seems utterly changed." The journal lasted for only seven months and thirteen issues. During this time it only obtained 400 or so regular readers. The editorial work has not been easy. We have been hemmed in on every side by lack of funds. We have, moreover, been promoting a constructive creed, which had not only to be erected as we went along, we had also to deal with the controversy which this constructive creed left in its wake.... The entire campaign has been carried on indeed only at the cost of a total expenditure of energy, and we, therefore, do not hold it possible to continue the same amount of work, with diminished resources, if in addition, we have to bear the entire anxiety of securing such resources as are to be at our disposal. Freedom! That is the first and last with Dora Marsden. She makes women understand for the first time what freedom means. She makes them want to be free. She nerves them to the effort of emancipation. She sows in a fertile soil the dragons' teeth which shall spring up as a band of capable females, knowing what they want and taking it, asking no leave from anybody, doing things and enjoying life. Freewoman! At last, in February 1913, Harriet Shaw Weaver and Dora Marsden met. They were in many ways totally unsuited - on the one hand, the rebellious, radical intellectual and on the other, the quiet, modest, unassuming and orderly Weaver. Yet they took an immediate liking towards each other - Weaver impressed by Dora's intelligence and indeed, her beauty, and Dora by Harriet's keen but systematic approach to the re-launch of the paper. Dora had originally just wanted a chat but they ended up in effect having a business meeting while all the time establishing their mutual respect and admiration. For Dora this friendship was to become as important as her relationship with Mary Gawthorpe, in some ways filling the vacuum left by their parting in 1912. Dora had found another woman who, impressed by her talents, seemed willing to help her in her project. Yet it was no cynical abuse of a simple and blind devotee - Harriet was too intelligent for that - and Dora wrote warmly and sincerely to Harriet after their meeting, thanking her for her help. I must thank you for the great personal kindness you have shown me while I have been in London. Quite apart from what you have done and are preparing to do to help the paper, your kindness in running about with me in my pursuit of hopes, has been a most valuable thing to me, and I must confess that I entertain feelings of very lively gratitude on that account. Please accept my very warm thanks. Emily Wilding Davison gave a crowd of degenerate orgiastics a new sensation.... Causes are the diversion of the feeble - of those who have lost the power of acting strongly from their own nature. They are for the titillation of the senses of the herd... Davison did not understand that the presence of the tiny handful of people like herself in a spectacular affair was a very considerable embarrassment to the situation, which accounted for the suspicion and semi-disgrace in which they were constantly held; that their presence was just tolerated because occasionally the organisation might need to dump them down, one here and one there to act as living beings for an occasion and then to return them to the role of automaton.